NOTICE Before using the windshield wipers when there is a heavy accumulation of snow or ice on the windshield, defrost the windshield for about 10 minutes, or until the snow or ice is removed. This will help ensure proper windshield wiper operation. 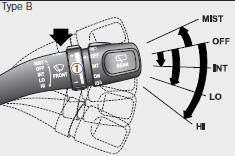 Windshield washers In the OFF position, pull the lever gently toward you to spray washer fluid on the windshield and to run the wipers 2-3 cycles. Use this function when the windshield is dirty. The spray and wiper operation will continue until you release the lever. If the washer does not work, check the washer fluid level. If the fluid level is not sufficient, you will need to add appropriate non-abrasive windshield washer fluid to the washer reservoir. The reservoir filler neck is located in the front of the engine compartment on the passenger side. NOTICE To prevent possible damage to the washer pump, do not operate the washer when the fluid reservoir is empty. WARNING - Windshield washer Do not use the washer in freezing temperatures without first warming the windshield with the defrosters; the washer solution could freeze on contact with the windshield and obscure your vision. 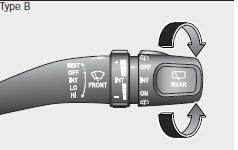 CAUTION • To prevent possible damage to the wipers or windshield, do not operate the wipers when the windshield is dry. • To prevent damage to the wiper blades, do not use gasoline, kerosene, paint thinner, or other solvents on or near them. 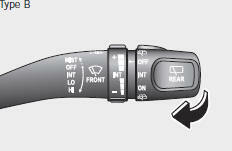 • To prevent damage to the wiper arms and other components, do not attempt to move the wipers manually.